This morning I decided to forgo my usual morning run due to the unexpected cold that’s made its way to Ewing, and headed over to the gym instead. The horribly boring, dreadful gym. I had to spice it up a little bit, so naturally I brought along the latest issue of Food Network magazine to read while elliptical-ing along to the sound of the White Stripes. I think the people around me appreciated the delicious looking cinnamon buns that glazed graced the pages of May’s Homemade issue. In my time flipping through the mag (making sure that no one else could actually see my mouth water), I stumbled across an advertisement for a new product from Wendy’s that leads me to believe they’re changing their approach and reevaluating their standing in the fast food market. 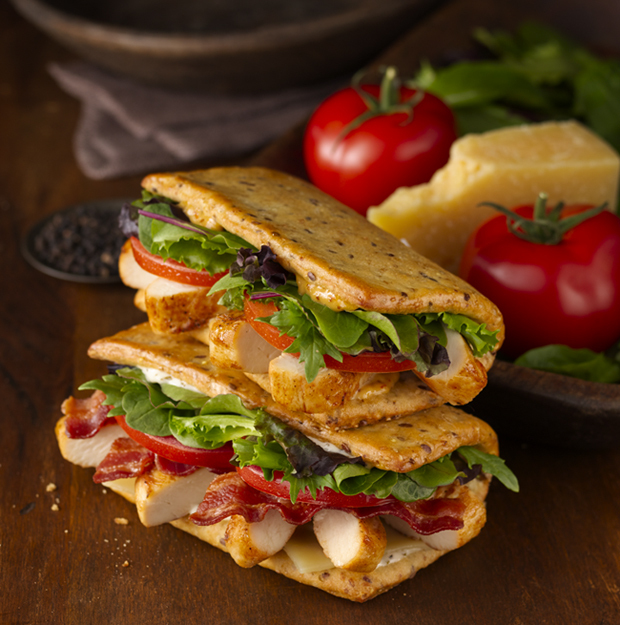 The new Flatbread Grilled Chicken offered by the national chain is like a grown-up version of what Wendy’s has always wanted to be, at least in my eyes: a more healthful alternative to McDonald’s and Burger King. In some ways, Wendy’s may even be taking a stab at striking up a competition with places like Panera and Au Bon Pain that make quality, healthy options fast. But let’s think about it like this: next time you’re out running errands and fast food is your only option, you’ll thank that girl from Advantageous Advertising because without her you’d be left to your own, burger-craving devices. You’re welcome. Despite the fact that this blog is named Advantageous Advertising, I’ve realized that I have to take a moment and discuss the importance of promotional activity in the grand marketing scheme. Over the past few years, companies have been spending way, way more on promotions than they have for the advertising of the very same products. But it wasn’t until reading a few posts on INMA (our favorite collection of blogs for all things marketing and advertising) that I realized how important promotion has become as of late. It is very difficult to track how many people have seen an ad, how many of those people actively participated and interacted with the ad, and how many of those people actually followed through and purchased the item being advertised. With promotion the guess work is gone. If the company’s goal is increased store traffic, a promotion for that store will either produce the results or it won’t. It’s that simple. If a promotion works, the goal is reached. If a promotion fails, it looks like you’ve still got some marketing to do. To be efficient with a promotion, it’s easy to narrow down the targeted segment. Want to increase sales in Oklahoma? Send out coupons and flyers in Oklahoma. Is the store on the corner of Pine Street and Pennington doing poorly? Promote a discount valid only at that location. Get strategic with your promotions and see what happens! In the age of the internet, once an advertisement hits the media, it can be saved and shared and shown forever. Promotions, on the other hand, last only as long as you want them to. Maybe you’re only interested in offering discounts to shoppers before 1pm. Or after 4. Or maybe just in months ending in “-ember.” No matter what your strategy, promotions are great for managers with a limited amount of time. Once you meet your goal, the promotion can be cut back. It’s up to you. These are just three of the reasons that promotion is surpassing advertising in marketing dollars spent. Three more reasons not to underestimate the power of promotion! After writing my last post about what it takes to build a brand, I decided to think a little further into it and apply it to my own professional situation. As a current college student, now is the time for me to figure out what it is I want to do with my life and what it will take to get there. 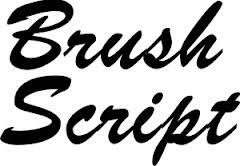 In my Writing for Interactive Multimedia course this semester I have been able to take the time and make a conscious effort to build my own brand. We blog (oh, hey), we write, we take pictures for digital journalism pieces, and we learn to build our very own websites. In the beginning of the semester I denied the fact that in less than 4 months I would have a fully active blog and functional website, but now that there are only a few more weeks of classes left before summer (glorious, glorious summer) it’s starting to hit me that it may all be possible. 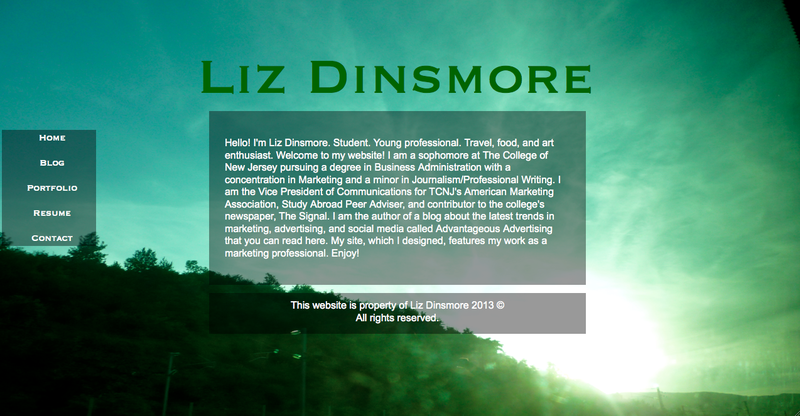 I’m building my brand by defining who Liz Dinsmore is to my professors, peers, and potential employers. And the culmination of all this hard work will be the completion of my website. I’m learning HTML and CSS as I go, but as it stands now, I think I’m doing fairly well! It’s kind of fun to see what is possible to do with my computer’s notepad and a good web design book. I recommend Build Your Own Website the Right Way Using HTML & CSS by Ian Lloyd. The title may be a bit long, but the content is incredibly useful…especially for those with zero (and I mean zero) previous experience with anything even remotely technological. Here’s a sneak peak at the work I’ve done so far! So after figuring out what a div is and why you need to close them with slashes and href’s and links and all those fun things I think I realized something: building this website completely from scratch is one of the best possible ways for me to show employers that I can learn quickly and produce something of value. In this age of technology, it could be my new found HTML and CSS skills that land me a job over someone who may not have gotten around to learning them yet. My advice to you is to think about your brand and how you want to present it. Is a portfolio website your best bet? Maybe. Or maybe you should focus on perfecting your resume and worry about a website later. Whatever works for you. As long as you know who you are, and what your professional brand is, no matter how you present it you’re bound to succeed. Recently I have been feeling like everything I’ve ever learned about marketing, advertising, job hunting, career building, living, and breathing has revolved around one thing, and one thing only: building a brand. What is my personal brand? What is my professional brand? What do I want my colleagues, professors, and potential employers to think of when they think of Liz Dinsmore? These are the questions that keep me up at night (I hope this is the worst problem in my life…). Nabisco’s Ritz Crackers are not only a delicious snack, but also a perfect example of a successfully branded product. What comes to mind when you think of Ritz? A game day treat? A casual cocktail party hors d’oeuvres? A post-playground snack for school-aged cuties? If you said yes to all three…nice work! 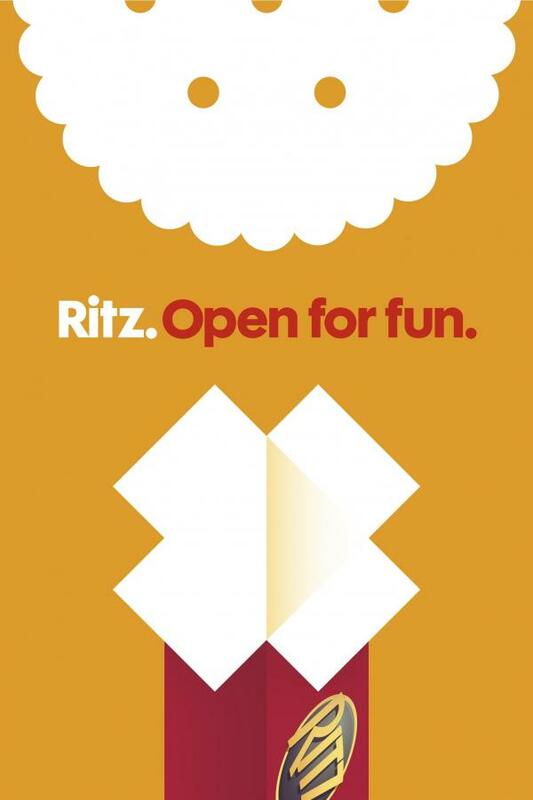 Ritz has branded itself as being the perfect gourmet accompaniment for the social butterfly in all of us via their widely recognized and appreciated “Open for Fun” campaign. Let’s take a look, shall we? There you have it, folks. A perfectly branded product. If these ads don’t make you want to run to the nearest store and open up a box of Ritz (or should I say “open up a box of fun?”), I don’t know what will. I’m sure you’re all familiar with Oreo’s Dunk in the Dark ad that ran during the black out that defined this year’s Superbowl. And some of you may have heard of Oreo’s Cookie vs. Creme debate that skyrocketed their social media presence and took Instagram by storm. But has anyone heard of Oreo Skies? The mobile app for Nokia Lumia phones sponsored by Oreo to ignite brand recognition and excite consumers about milk’s favorite cookie? App-users can navigate the galaxy and view the constellations through a kind of “augmented reality.” Oreo worked with Harvard University’s Robert Kirshner to collect all sorts of facts about the stars, planets, and other galactic phenomena you have access to through Oreo Skies. Occasionally, a shooting star will zip by carrying Oreo offers, incentives, and even special recipes! Once you fall in love with this app, Oreo’s goal is to have you share the love with your friends and family by recommending it and passing it along. Once everyone you know is connected to Oreo Skies, you can send them messages in the stars! You simply type out a message to, for example, your second cousin once removed named George but whom everyone calls Mike, and he’ll receive it in no time! What’s more? Your greeting will look like a star in the sky that must be twisted open (like an Oreo, hehe) to reveal the message. It’s fun little details like the shooting star promotions and twistable star messages that really make this a marketable app. Oreo’s goal is to boost sales in 2013 after a disappointing 2012…so by creating Oreo Skies, they are not only updating their image, but they are also continuing to utilize the social media outlets that have treated them so kindly in the past. Keep doing what you’re doing, Oreo! Everyone with a Nokia Lumia should check out the app and let me know what you think! Since his installment as the newest leader of the Catholic Church, Pope Francis has made a name for himself in the world of social media. He sends out inspirational and informative quotes to his hundreds of thousands of followers using a variety of fonts, colors, and pictures to capture the attention of the Facebook community. THE POPE IS ON FACEBOOK?!?! I guess this means social media really is for everyone. So my advice, as a fellow blogger and fan of all things social media related, is to get creative on Facebook. The Pope is doing it, so why can’t we take a tip from him and get ourselves started with this fun, albeit unexpected, new trend? On Saturday, a man by the name of John Militello, the Head of Creative Innovation at The Zoo, Google, and YouTube, gave an incredible presentation about how Nike was able to produce such a successful campaign last summer during the Olympics. Nike’s Find Your Greatness spots were innovative and took a new approach to capturing the attention of athletes around the world. So now I leave the rest to you. Below are a few links to the YouTube videos Nike has posted from their campaign. Keep their mission statement in mind while watching and think about how clearly Nike alludes to the Olympics without a single reference to the games themselves. Enjoy! Thursday marked the conference kick-off. There were activities galore, and it was important for the group of us to take in as much as we possibly could. At 5 o’clock, the six of us from The College of New Jersey participated in the annual Social Scramble. 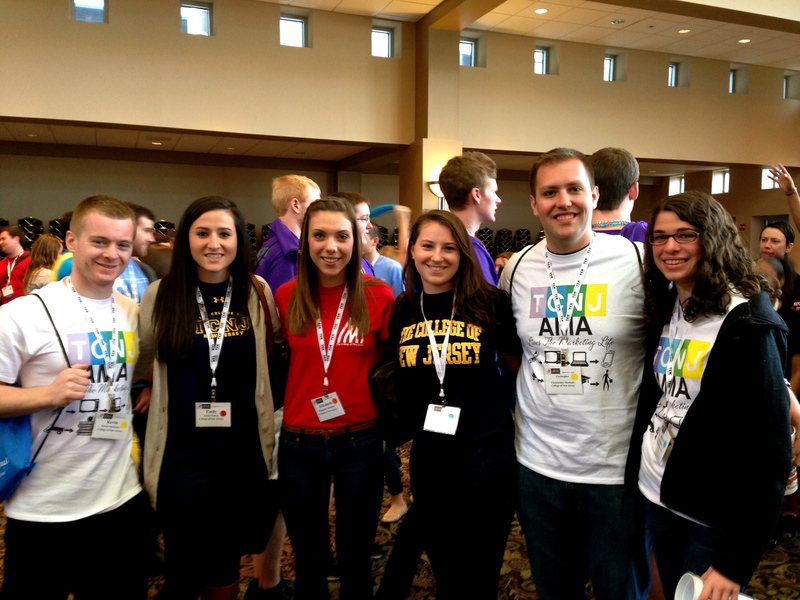 We got to meet other collegiate AMA members from all over! I even met a student studying abroad in Boston all the way from Italy! This was a fantastic way for members of all the chapters to introduce themselves to each other and get a little more comfortable. Definitely gets a thumbs up from me! Members from TCNJ’s AMA looking very official with our name tags! After this fun social event, we filed into an auditorium for the official start of the festivities. The keynote speaker on Thursday was a man by the name of Jeffrey Hayzlett, former Chief Marketing Officer of Kodak. Not only is Mr. Hayzlett a very successful businessman, but he is also a self-proclaimed cowboy who will always be seen in his signature leather cowboy boots. Mr. Hayzlett was the perfect guy to start the event. He worked the crowd and gave us wonderful advice for our future careers in marketing. My takeaway from his talk was to be a clock changer. Now as odd as this may sound, it is important to think about what I mean by this…so I’ll give you a little background on Mr. Hayzlett’s favorite kind of people: the clock changers. When he was first offered the position as CMO at Kodak, the first thing he planned to do was hold a meeting for the people he would be working most closely with. From head designers to market researchers and everyone in between, Jeff wanted to get to know his colleagues. He arrived in the meeting room about 20 minutes early so he could personally greet everyone in attendance, but before it all began he had something else planned as well. You see, Mr. Hayzlett noticed a nice, big clock hanging on the wall above the meeting table. Before anyone arrived, he took the clock off the wall, set it 20 minutes fast, and then replaced it right back where it came from. As people started filtering in, he would watch them all look at the clock, look at their watches, and then look at the clock again. As more people arrived they would agree that the clock was 20 minutes fast and that “something must be done! !” (rather enthusiastically I imagine)…but no one ever did anything about it. In fact, this went on for 2 full months. Two. Months. Until finally a young woman pulled over a chair, climbed up to the clock, fixed the time, and replaced it on the wall. She was a clock changer, and the next day, Mr. Hayzlett gave her a promotion. He wasn’t talking about literally changing clocks. What Jeff meant by all this was that we won’t get very far in business, or in life for that matter, if we don’t take initiative. It’s important for each and every one of us to get up and do something about things that need to be fixed. If something is wrong, speak up. In the marketing industry, communication is crucial. Ideas for campaigns or new marketing strategies must be shared on multiple levels, with many different people, with various outlooks on the subject. By speaking up and voicing your outlook, it is very likely that others will take on a new perspective on the problem at hand. So take initiative. Be a clock changer. Don’t worry about speaking up, worry about what may happen if you don’t.